Lee performed White II throughout the weekend. He entered one of the smaller black plastic covered circles on the floor of the performance space clothed, as the show opened on both days. 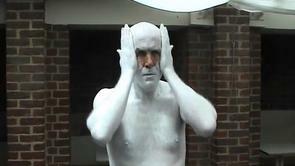 He then proceeded to strip and slowly cover his body in white body paint during the first hour of the performance. He started with his feet and paused at five minute intervals as he applied the white paint progressively up his body to end by covering his face and dusting his body with white talcum powder. Once completely white, he transferred to the central, larger black circle to spend ten minutes standing, sitting and lying across the circle. His orientation within the circle matched the angle of the big hands on the two large clocks leaning on the pillars either side of the performance space. Before leaving the space, Lee moved to the third black circle to wash the paint from his head and hands, dress, and then leave the performance space, apparently as he had started. Assisted during installing the performance space by Bruce Currie and Hubert. Video filming by Bruce Currie and Steve Brown. Video editing by Steve Brown. Philip thanks all those involved in the making of this work.